Want to be notified of new releases in sunaku/vim-modusline? 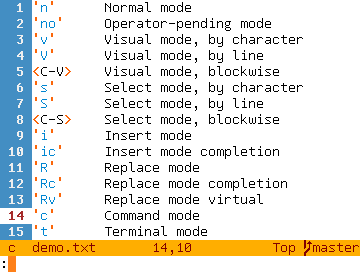 This plugin adds mode-specific coloring to your existing statusline so you can visually distinguish (screenshots below) which mode Vim is currently in. 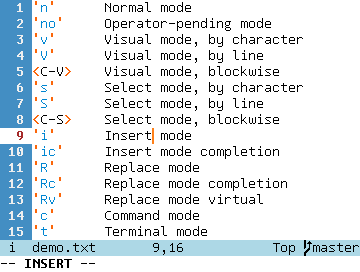 Install this plugin using your favorite Vim plugin manager and restart Vim. 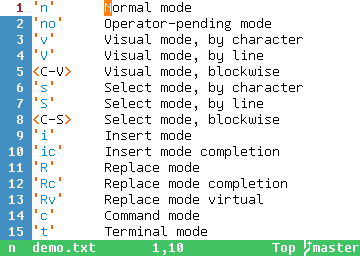 Now change Vim modes and observe the statusline changing colors accordingly. That's all! 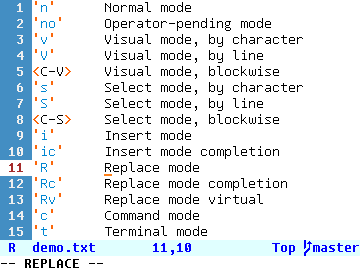 For customization, read about Variables and Functions below. You can redefine any of these variables per your customization needs. 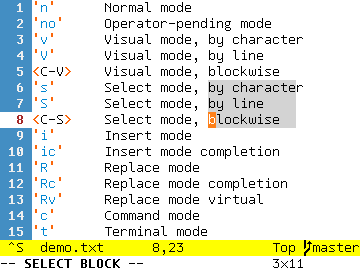 You can define your own custom statusline (the default one is shown below) and this plugin will automatically add mode-specific colors & labels to it. 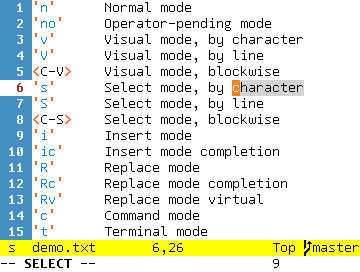 A dictionary that maps mode() values to %#HLname# statusline colors. 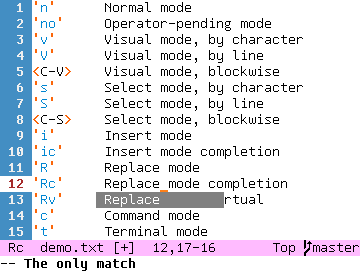 If there is no entry for a particular mode() value in the dictionary, then this plugin falls back to using jarring %#ErrorMsg# as the color. 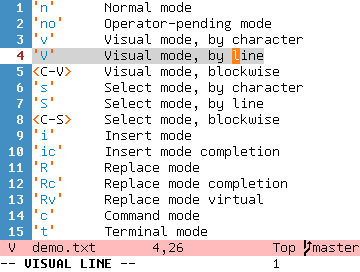 For a list of possible HLname values, run the Vim :highlight command. 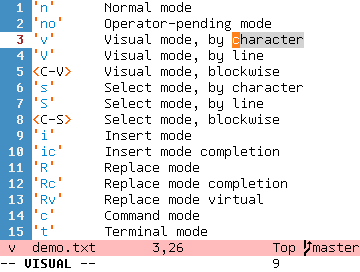 A dictionary that maps mode() values to user-friendly labels (strings). 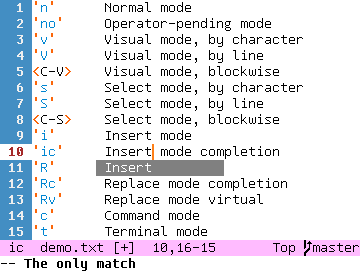 If there is no entry for a particular mode() value in the dictionary, then this plugin falls back to using that mode() value as the label. You can redefine any of these functions per your customization needs. 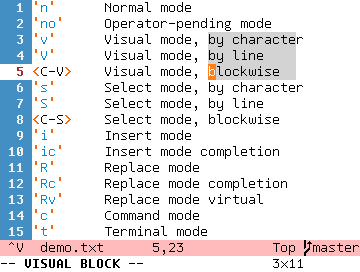 Adds mode-specific colors and labels to the given statusline and returns a new statusline expression that you can assign via :set statusline=. 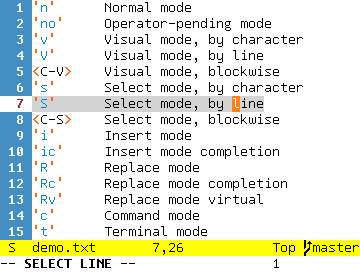 Returns a %#HLname# statusline color for the given mode() value by referencing the g:modusline_colors dictionary, as described earlier: If there is no entry for a particular mode() value in the dictionary, then this plugin falls back to using jarring %#ErrorMsg# as the color. 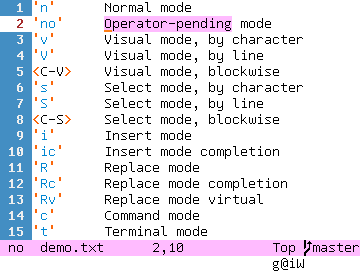 Returns a user-friendly label (string) for the given mode() value by referencing the g:modusline_labels dictionary, as described earlier: If there is no entry for a particular mode() value in the dictionary, then this plugin falls back to using that mode() value as the label. 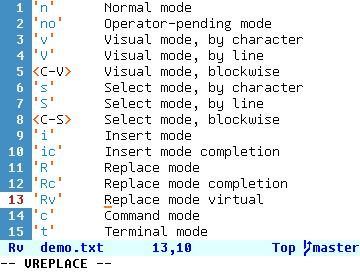 Returns a statusline expression built up from all the pieces passed in. 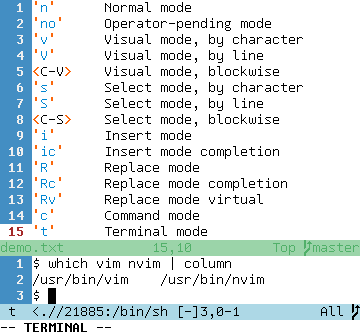 Distributed under the same terms as Vim itself.